This early relative of a hedge hog was covered with bristle hairs similar to modern hedge hogs but had scales on its head and tail. 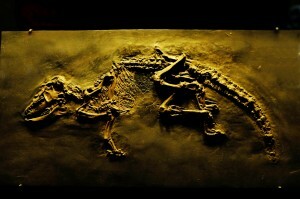 Traces of the bristle hairs can be seen as a faint black silhouette around the fossil. The stomach contents are also preserved and visible. This perfect articulation of the skeleton and the tantalizingly preserved traces of soft tissue point to a quick burial, absent of scavenging and bioturbation – a hallmark of the unique preservation found at the Messel Pit. Heavens, I think I know the Curator! Wow, nice stuff Dave! Next Post Tis the Season to be worried about butterflies!